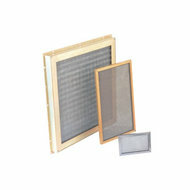 Type V Air Filters - Airsan Corp.
Airsan Type V filters are specially designed for equipment essential to operate electrical control systems, ventilation and shipboard lighting systems. Precision construction prevents the filter media from settling or changing density, while efficiency remains unaffected by dramatic changes in temperature or climate. The all-metal construction withstands vibration and shock, and RF shielding is available for special applications. AIRSAN TYPE V FILTERS HAVE BEEN SPECIALLY DESIGNED FOR EQUIPMENT ESSENTIAL TO OPERATE ELECTRICAL CONTROL SYSTEMS, VENTILATION AND SHIPBOARD LIGHTING SYSTEMS. PRECISION CONSTRUCTION PREVENTS THE MEDIA FROM SETTLING OR CHANGING DENSITY, WHILE EFFICIENCY REMAINS UNAFFECTED BY DRAMATIC CHANGES IN TEMPERATURE OR CLIMATE. THE ALL METAL CONSTRUCTION WITHSTANDS VIBRATION AND SHOCK, AND RF SHIELDING IS AVAILABLE FOR SPECIAL APPLICATIONS.